In a dangerously inflammatory speech to the UN General Assembly, this week, a warmongering Israeli Prime Minister, (currently under investigation for fraud, bribery and corruption by his own Justice Department), incited violence by calling for insurrection by the Iranian people against their democratically elected government. It was a speech that should never have been allowed, by a politician who is determined that his secretly nuclear-armed state becomes the regional hegemon with help from a compliant American president. Netanyahu is determined to persuade Trump to try to scupper the nuclear deal with the Iranian state that was negotiated by the United States, the United Kingdom, Russia, Germany, France, China and the European Union and brokered, in 2015, in order to facilitate peace in the Middle East and the non-proliferation of nuclear weapons. Israel, of course, is the only undeclared nuclear weapons state in the world having secretly built up an arsenal of up to 400 nuclear warheads – enough to destroy the entire Middle East and Europe. The UN Security Council should now propose a Resolution demanding that Israel submit its secret nuclear arsenal to inspection by the International Atomic Energy Agency (IAEA) and becomes a party to the nuclear Non Proliferation Treaty (NPT), the Chemical Weapons Convention (CWC) and the Biological Weapons Convention (BWC), failing which it should be subject to international trade sanctions as well as a comprehensive arms embargo. 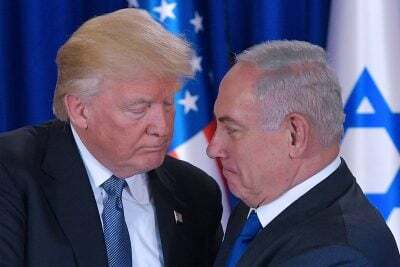 Trying to overturn the internationally agreed deal with Iran is a dangerous strategy for nuclear dominance by Netanyahu that must be stopped in its tracks by the European Union, China and Russia, in the interests of world peace.